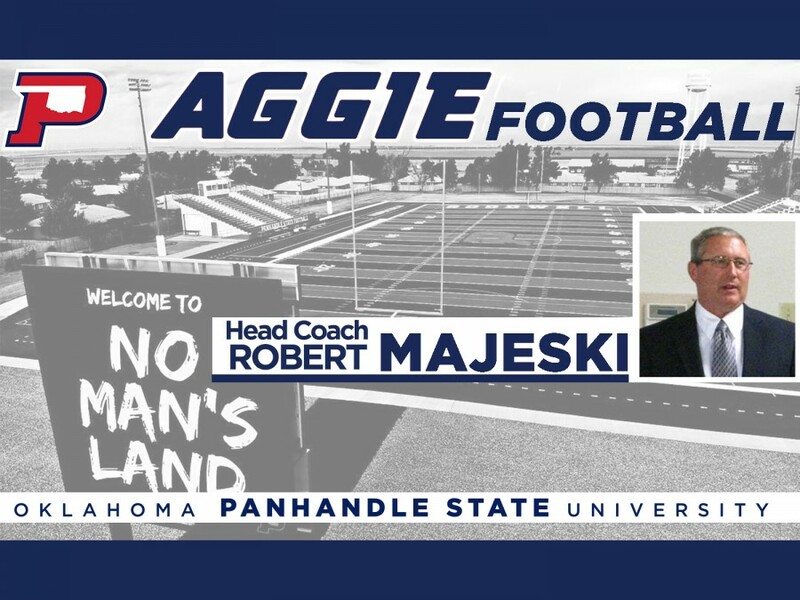 Released by Panhandle State Campus Communications on 12/20/2018 Robert Majeski Jr. will take the helm as the next head coach of the Aggie Football program. Goodwell, Okla. — Robert (Bob) Majeski Jr. will take the helm as the next head coach of the Aggie Football program. Following a national search, Oklahoma Panhandle State University Director of Athletics Meghan Mulcahy announced the decision Thursday, December 20, 2018. Majeski has 34 years of coaching experience at the collegiate level with eight of those being as a head coach. Majeski comes to Panhandle State from Deland, Fla. and Stetson University. Majeski previously served as the head coach at Dodge City Community College (DCCC) in Dodge City, Kan. and at Black Hills State University in Spearfish, S.D. In 2011, he was named the Kansas Jayhawk Conference Coach of the Year after leading DCCC to the conference playoffs. Prior to arriving at Dodge City, he served as the Defensive Coordinator at Coffeyville Community College in Coffeyville, Kan. where the defense was ranked number one in the conference in 2006. Consistently producing teams that rank in the top 10 in the nation and top three in their respective conference, having coached at seven other colleges and universities. A graduate of the University of Nebraska- Omaha, Majeski earned a Bachelor of Science degree in General Studies and an emphasis in PE. Majeski played at Kansas State University as a wide receiver from 1980-1983. Majeski feels Panhandle State and the town of Goodwell are a great place to recruit to in addition to providing student-athletes an outstanding atmosphere to obtain their academic and athletic goals.